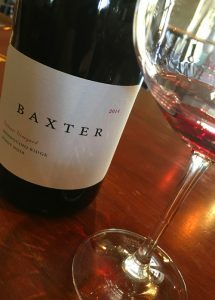 2014 Baxter, Pinot Noir, Valenti Vineyard, Mendocino Ridge. The beautiful and pure Baxter Valenti Pinot Noir from the cool climate site in the western end of the Anderson Valley in the Mendocino Ridge zone is a lovely and elegant wine that showcases both the stylish, though restrained winemaking and a sense of place. Baxter has risen to notoriety in recent years and are best known for their Pinot Noir(s), though they do a few other interesting interesting things including a Nebbiolo, the winery is a father & son partnership between Phil L Baxter and Phil T G Baxter, conceived to produce handcrafted single vineyard wines focusing on the Anderson Valley and surrounding Mendocino appellations with the pair combining more than fifty years of experience. Phillip Baxter the younger is becoming the face of winery and is part of the Anderson Valley generation that has made this region one of the best in the world, and like Jason Drew’s Drew Family Cellars bottlings, the Baxter wines are highly sought after and very limited, also Baxter trained in Burgundy with Pascal Marchand at Domaine de la Vougeraie and has put that to good use, as I noted when I reviewed his 2012 whole cluster Oppenlander a few years ago. The Valenti family originally started farming grapes on their homestead over 100 years ago, and the site is now farmed to organic practices by the mentioned Jason Drew. This Cru vineyard sits high upon Greenwood Ridge in the Mendocino Ridge appellation, according to Baxter, Valenti is nick-named ‘Islands in the Clouds’, because these ridge-top vineyards appear like islands peeking out from the maritime fog above the valley set on Gold Ridge loams, well-drained ancient oceanic soils with decomposed sandstone and with a high iron content and It is just a mere five miles from the Pacific Ocean, a stone’s throw from Baxter Winery. The Mendocino Ridge zone appellation (AVA) is special as it consists only of the coastal Mendocino ridge-top areas above 1200ft, and Valenti is one of the star vineyards as it shows clearly in this 2014 Baxter version with it’s layers of black cherry, plum and racy currant fruits along with wonderfully refined underlying acidity that keeps every detail brilliant and fresh on the rich medium bodied palate, additional notes of mineral, wild herbs, spice and subtle oak that flows in the mouth in a round and seamless fashion. Baxter usually works with native fermentation and per normal with his Pinots it looks like they use some whole cluster, though maybe not a high percentage on this 2014?, once pressed, the wine spent 18 months in a mix of neutral French oak barrels and small bit in stainless steel before being bottled unfined and unfiltered, and aged a further six months prior to release. The aftertaste gets better and longer with each sip and air adding rose petals, blood orange, a touch of vanilla and raspberry cream, this is silky stuff, I think it shows off lots of potential and it could age another 5 to 7 years with ease, but it is drinking fabulously right now, impressive and delicious!